We are pleased to bring you a new 2010 edition of AJ. 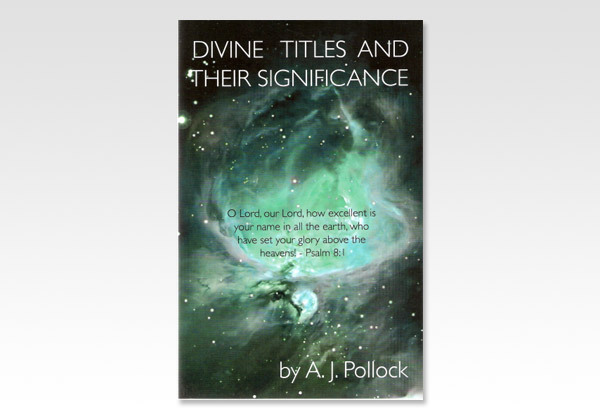 Pollock's Divine Titles, probably written in the first half of the 20th century. When we see with what variety of titles or names our God is spoken of in Scripture, we get a much greater appreciation of who He is, and a greater appreciation of the Trinity - the Father, Son and Holy Spirit. God evidently gave the Hebrew language to have a singular, dual (two) and plural (three or more) words, and the plural word for God is used in Genesis 1:1, yet the word created is in the singular. Thus we get the Trinity acting as one God at the very beginning of the Bible. Many other such gems are found in this book. We believe you will enjoy it greatly! Brother Pollock was born in England in 1864. Later in life he traveled extensively ministering the Word, including the USA in 1898. He wrote a number of very helpful books, including this one. He went to be with his Lord in 1957.